This is probably the most common reason for voice problems and is caused by the muscles of the larynx squeezing either from side to side or back to front or sometimes both. This leads to difficulties maintaining pitch, easy fatigue, pain and loss of voice. There is often a very significant emotional element to the problem and the more worried the patient becomes about the voice the worse the symptoms get. It can be triggered by stress, acid reflux or sometimes following excessive use. Most patients will respond very well to speech therapy using exercises to allow the laryngeal muscles to relax. Occasionally we will recommend laryngeal manipulation which is a sort of physiotherapy for the larynx this may be done by your speech therapist or a specialist physiotherapist. Vocal cord nodules are caused by thickening of the edge of the vocal cords. The nodules are completely benign and cause problems by preventing the vocal cords from closing. This leads to the voice sounding breathy or husky. In singers it will often cause loss of the top part of the vocal register. Patients will also often complain of easy tiring of the voice and can also have pain after singing or speaking as it uses more effort to get the vocal cords to meet. The normal treatment is to change lifestyle factors, speech therapy exercises and sometimes surgery if other measures do not work. In this condition stomach contents come up into the gullet and cause irritation of the larynx. Unlike classic symptoms of reflux, patients often do not have heartburn, more commonly in addition to the hoarse voice they may feel the need to clear the throat frequently and experience a feeling of mucus or tightness in the throat. The problem may get better with lifestyle changes related to diet, weight loss and reduction in caffeine and alcohol. Medication may be used to suppress the production of acid (omeprazole or ranitidine) or to reduce the ability of the stomach contents to escape (gaviscon). If the problem is still not settling patients will need to see the gastroenterology team to see if the valve closing the bottom of the gullet is working. If it is not a simple procedure can be done to tighten the valve and stop the reflux. 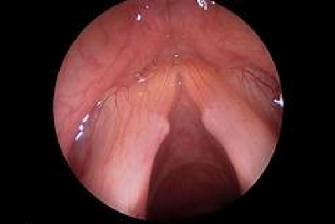 Most vocal cord polyps are only on one vocal cord. They are usually softer than vocal cord nodules and we think are caused by a defect in the cover tissue of the vocal cord. They do not usually disappear with speech therapy. Some polyps have blood vessels running into them and the symptoms can become suddenly worse if the blood vessel breaks and there is bleeding into the polyp. The symptoms are similar to vocal cord nodules. The usual treatment for vocal cord polyps is surgery. There is another type of vocal cord polyp which usually affects both vocal cords. This is as a result of progression of a condition known as Reinke’s Oedema. 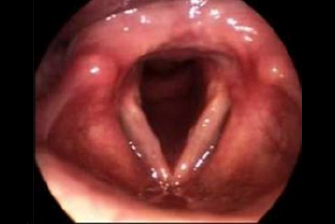 This condition is caused by accumulation of fluid in the loose space between the cover of the vocal cord and the underlying muscle (Reinke’s Space). This makes the vocal cord heavy and so it vibrates more slowly, this leads to a deeper pitch of the voice. The condition commonly affects women and often the patient will have had symptoms for many years but decide to visit the clinic when they are mistaken for a man when answering the phone. It is usually caused by irritation of the vocal cords by cigarette smoke or acid reflux and sometimes by a combination of the two. The main way to treat it is to remove the irritant factors which should allow the swelling to settle. If the vocal cords become too heavy and swollen then polyps will result and usually this can only be treated with surgery. 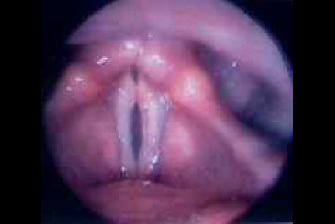 This is an irregular growth on the vocal cords caused by infection with the human papilloma virus. It is more common in men and can occur in childhood or later in life. When the condition occurs later it may be due to a new infection or a re-activation of the virus that is already in the body. With the onset of vaccination programmes against the virus it is hoped that the condition will become less common, however as boys are not routinely immunized this may not be effective. Very occasionally the type of virus causes changes in the cells and may be associated with cancer but most of these papillomas are benign. 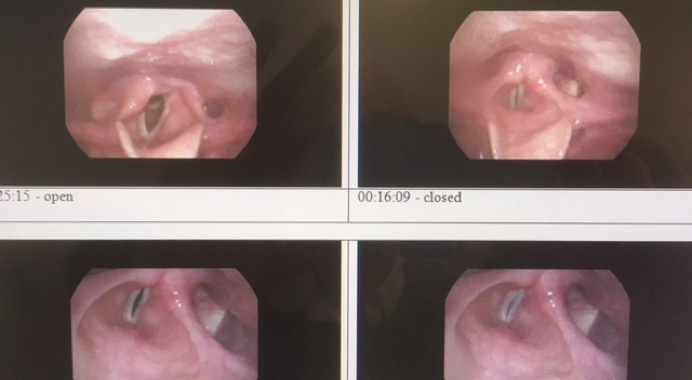 The growths affect the ability of the vocal cords to close and if they get very big they can cause breathing difficulties although this is rare in adults. The treatment is to remove the growths, there are a number of different methods to do this some using laser others with a surgical shaver or a coblation wand. The method of removal is usually a personal preference of the surgeon as there is no current evidence to suggest that one technique is better than another. As there is a tendency for the growths to recur the patients usually have to remain under follow up until there is no further recurrence. These occur at the back of the larynx and may be on one or both sides. They are associated with acid reflux and may follow on from an upper respiratory tract infection. They have a typical appearance and rarely need to be operated on, in fact if they are removed they normally recur. The treatment for granuloma is to remove the cause of the irritation by treating the acid reflux and or chest infection and to work with a speech therapist to assist in reducing trauma to the area. It may take many months for the granuloma to resolve. If there is doubt about the diagnosis or the granuloma does not respond to conservative treatment surgery may be suggested. This appearance can be seen when the middle part of the vocal cords does not close. One of the causes for the problem is weakness of the muscle inside the vocal cord this can happen after infection, use of steroids for asthma or with advancing age. A similar appearance can be seen in Parkinsons disease and sometimes changes in the voice can be the first symptom of the problem. The voice sounds weak and breathy and patients will often report that they cannot sing or shout. They may also have some problems with swallowing liquids due to the fact that the vocal cords don’t close completely and liquid can spill into the airway causing coughing. 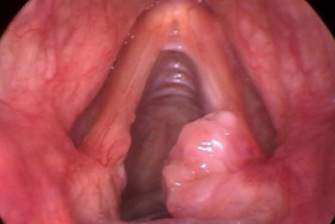 It can be treated with voice therapy or in severe cases injection of filler to allow the vocal cords to come together. The vocal cords move outwards when you want to breathe in and come together when you want to speak, cough swallow and also to conserve air when exercising. The muscles are controlled by a long nerve which comes out of the brain down through the neck and back up into the voice box this is called the recurrent laryngeal nerve. Due to the fact that the nerve is so long there are many places where it can be damaged so the whole length of the nerve needs to be looked at with scans if a vocal cord palsy is diagnosed. Patients with a vocal cord palsy will often have a weak voice with a breathy whispery tone. They may have difficulty swallowing liquids and find exertion makes them more out of breath. After finding a cause for the vocal cord not moving the next thing is to try and get the voice better. This may happen spontaneously or may require help from Speech therapy or surgery. The surgery may be a simple injection or a more complicated operation called a thryoplasty.